That religious faith that sustained him and his family and was clearly evident during his years in the White House and more recently as he mourned the April 17 death of his beloved wife of 73 years, Barbara, is being noted by many in paying tribute to his life and legacy after his death late Nov. 30 at age 94. His spokesman, Jim McGrath, announced the death of the former president in a tweet. The cause of his death was not immediately available, but he had been in failing health the last few years. In 2012, he announced that he had vascular Parkinsonism, a condition that limited his mobility and required him to use a wheelchair most of the time. The White House announced Dec. 1 that a state funeral is being arranged “with all of the accompanying support and honors.” President Donald Trump will designate Dec. 5 as a national day of mourning. He and first lady Melania Trump will attend the funeral at the National Cathedral in Washington. The flags at the White House were lowered to half staff. 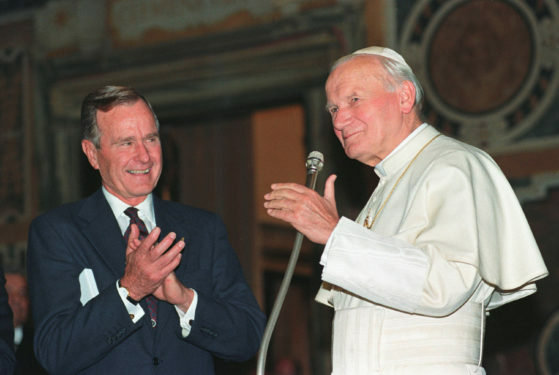 “Notre Dame joins with our nation and world in mourning the passing of President Bush,” said Holy Cross Father John I. Jenkins, president of the Catholic university in South Bend, Indiana. “He was the epitome of a public servant, not just in the Oval Office, but in his eight years as vice president, his many years as a congressman, ambassador and CIA director, and in his service in the U.S. Navy during World War II. Born in Milton, Massachusetts, June 12, 1924, Bush delayed entrance to Yale University to volunteer for service in World War II. At 18. he was one of the Navy’s youngest pilots. He was shot down during a 1944 bombing mission. After graduating from Yale, he became an oilman in Texas, but after his stint in the oil fields, he spent most of the rest of his life in public service – including as a two-term congressman from Texas, director of the Central Intelligence Agency, an ambassador, vice president under President Ronald Reagan (1980-1988) and finally president (1988-1992).